Affinity Charters is owned and operated by Charleston, South Carolina native Captain John Ward Jr. Captain John is a full time fishing guide who holds a 100-ton Masters License from the USCG, and has two current IGFA world records while fishing with customers. Capt. 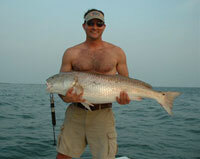 John has over 25 years of fishing experience in Charleston and surrounding waters. He makes it his own personal goal on every guided charter to provide a safe, productive, and memory filled fishing adventure. Charleston, South Carolina’s nutrient rich eco system provides productive year round fishing for: Red Drum, Black Drum, Speckled Sea Trout, Flounder, and Sheepshead. Seasonal species include: Bluefish, Barracuda, Sea Bass, Cobia, Jack Cravelle, Tarpon, Ladyfish, Spanish Mackerel, King Mackerel, and numerous species of Sharks. 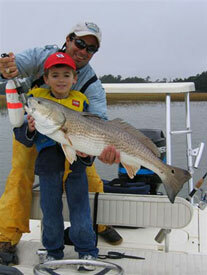 Charleston and surrounding waters provide numerous areas to fish. You can fish the Charleston back water flats, rivers, harbors, bays, creeks, ICW, Charleston Jetties, and numerous near shore reefs off of Charleston’s coastline. Most areas can be reached within 15 minutes or less to provide more fishing time on a charter. Affinity Charters offers ½, ¾, and full day fishing trips for light tackle and fly-fishing charters aboard a 2014 and 2016 24ft Sportsman Bay Boats and a 18ft Hells Bay Guide flats boat . Affinity is a state of the art fishing machine, which is equipped with all of the latest equipment to aid in saltwater fishing. 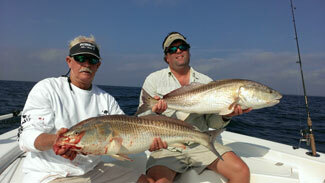 The boats draft less than 10 inches of water, which is great for stalking red fish in skinny water. Capt. John is sponsored by Quantum Fishing rods and reels, RipTide Baits, Ross fly-fishing Reels, and Maui Jim Sunglasses, and provides the newest and best available for your fishing pleasure. All tackle, bait, ice, fishing license, and photography are provided. Affinity Charters is Charleston’s finest inshore and flats fishing charter service. All guided trips are private and custom, so they cater to each client’s goals, wants, and skill level. Capt. 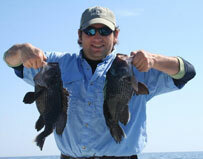 John Ward is a dedicated professional fishing guide with a History and Biology degree form College of Charleston. Charleston’s waters are full of life, and by special request: private eco tours, bird watching, harbor cruises, shelling, crabbing, historic, and corporate trips are available. 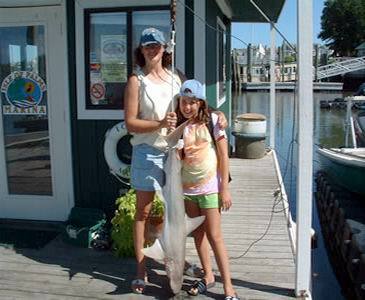 Fishing in Charleston is world class, whether you are sight casting a fly at schooling redfish, or battling acrobatic Black Tip Sharks or Tarpon on light spin tackle.